This past summer Emmy and I were out on a Saturday morning doing our thing… hitting the farmer’s market and yard sales along the way. 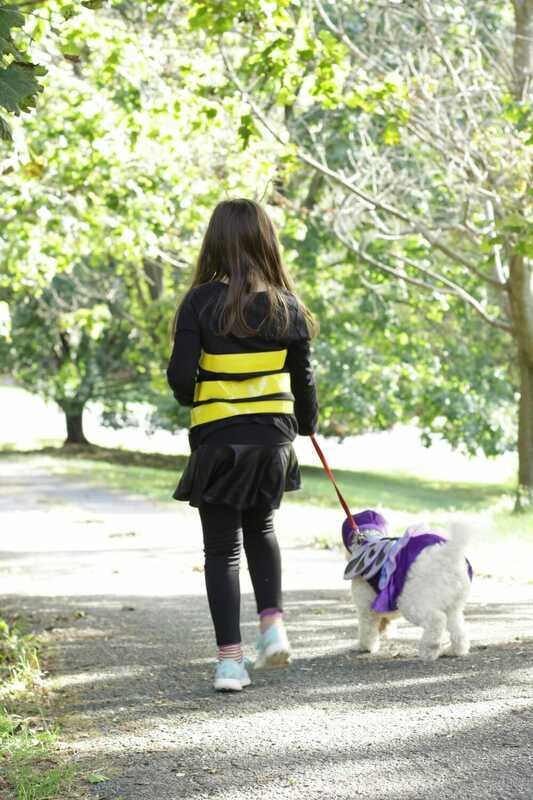 We stopped at one yard sale and found an adorable brand new with tags small purple butterfly dog costume- perfect for Snowball! When it came time to choose what she would be this year, Emmy wanted to coordinate with Snowball. 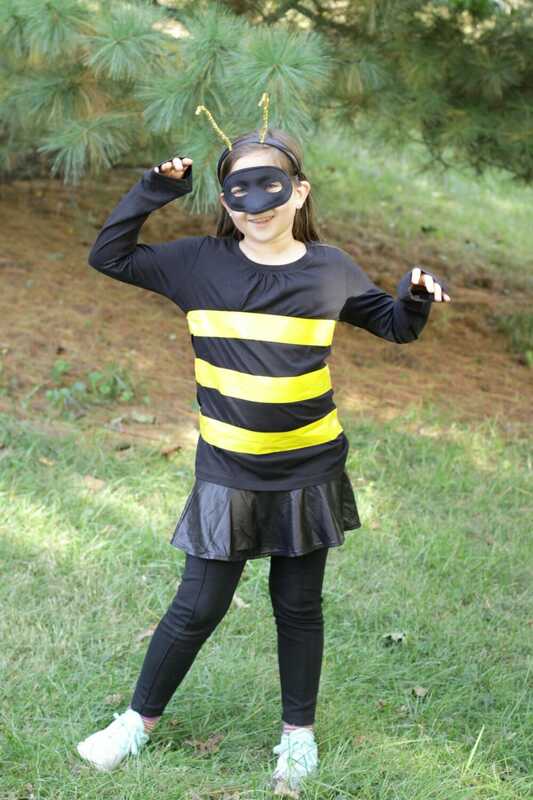 I suggested flower, fairy, another butterfly… but she picked bee! I was thrilled because I am not the master of costumes that my own mother is for my kids and was for me and this was one that I could easily create. 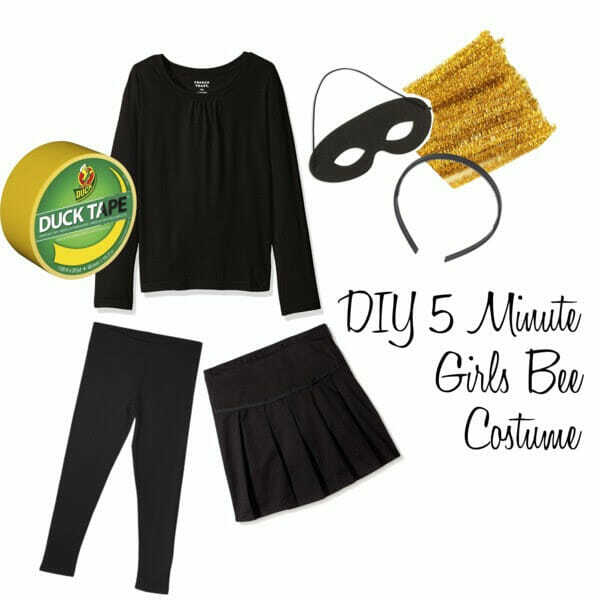 In fact it took barely any time at all, so I thought I would share our easy 5 minute DIY bee costume with you in case your kids are in need of a quick and easy costume. This costume was so easy to pull together. 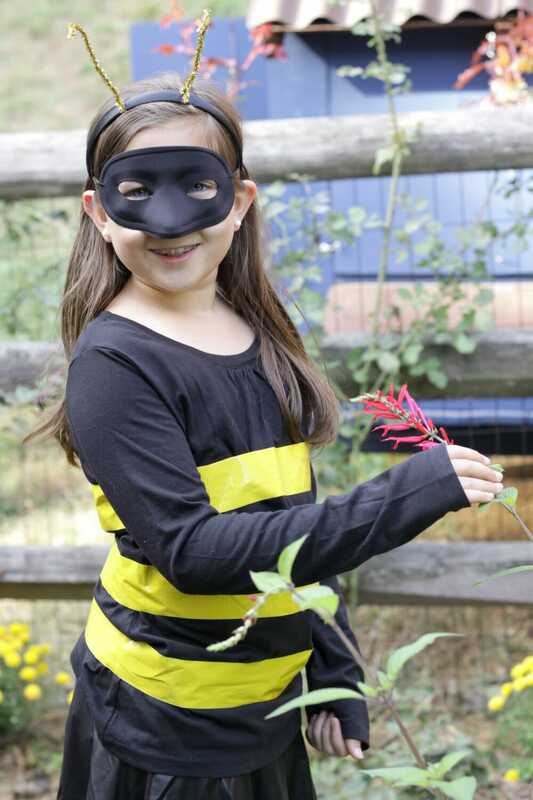 Emmy already had black leggings, a black skirt and gold pipe cleaners, so we just bought this black shirt and Yellow Duck tape from Amazon, and I found a black headband and the mask at a craft store. I had Emmy put the black shirt on for me, and I used the the duck tape to create three stripes. I started at the seam on the side of the shirt and traveled across the front as straight and as evenly as possibly, then had Emmy turn and follow along the back bringing the tape back to its stating point. When we reached that I cut it slightly overlapping. Next I used my hands to smooth out any wrinkles and press firmly on the shirt, securing the tape in place. For the headband I used two pipe cleaners, one per antenna. I found the center point and placed that on the underside of the headband where I wanted it. I then brought the pipe cleaner together and started twisting it which secured it in place. When I got to the top, I added a little bend to mimic a bee’s antennae. 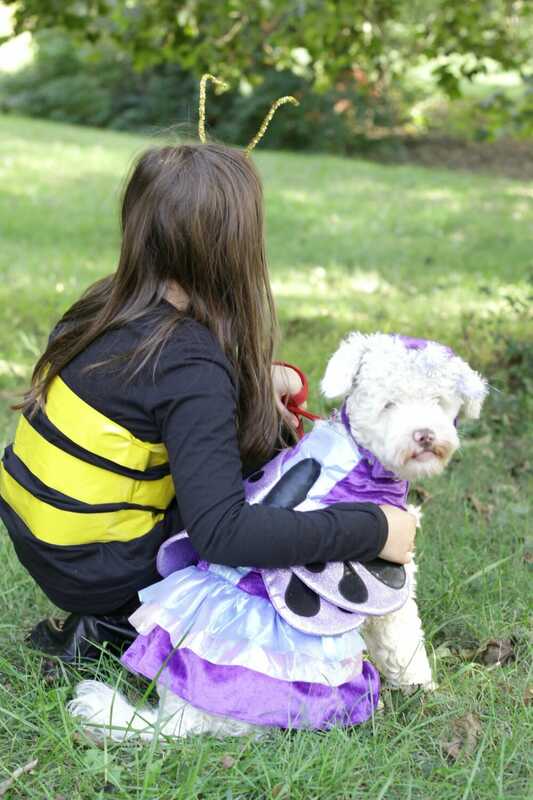 We actually had made one set of antennae with pom poms at first, but our sweet butterfly puppy got ahold of those… so these were plan b, but I think they work better as a bee anyhow. 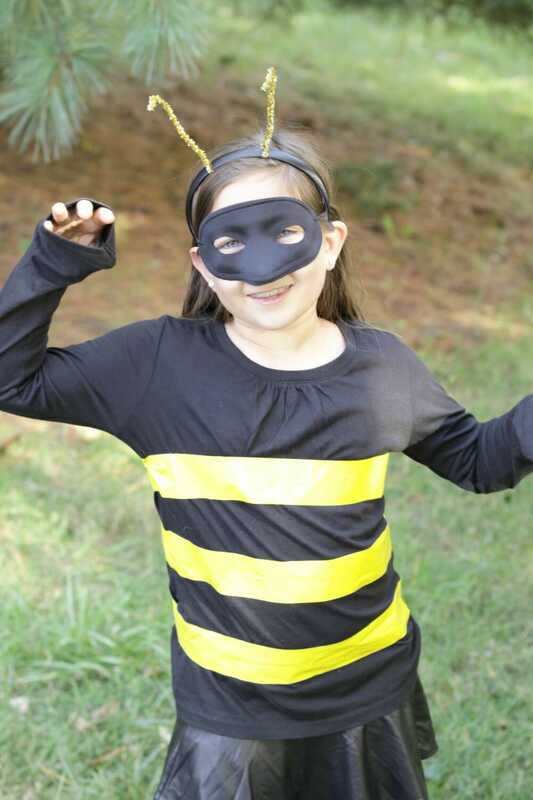 This might be the easiest and one of the least expensive costumes we have ever put together! 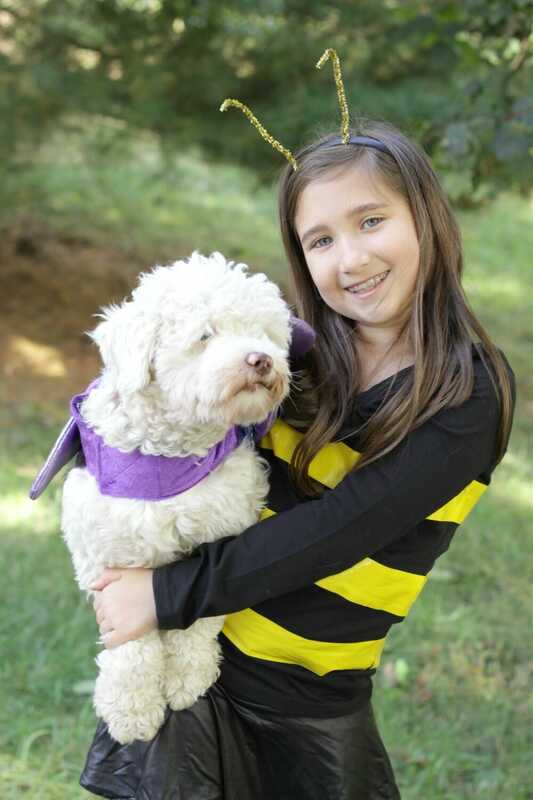 Emmy is looking forward to taking Snowball out when we go trick-or-treating this year. I am sure Snowball won’t know what to do with herself, but I am looking forward to one worn out puppy after a night like that! One costume down, and one to go! Wish me luck in sewing a Pokemon dragon hat… Or perhaps I should say pray for me and my sewing machine. *Affiliate links included for your convenience. Thank you for your support! So so cute and I love the two of them together. Best friends! they really are the sweetest pairing of girls. i don’t think we could have asked for a better match for emmy. Could not be cuter! So creative and the pair of them are darling! thank you so much! we had fun together planning it! 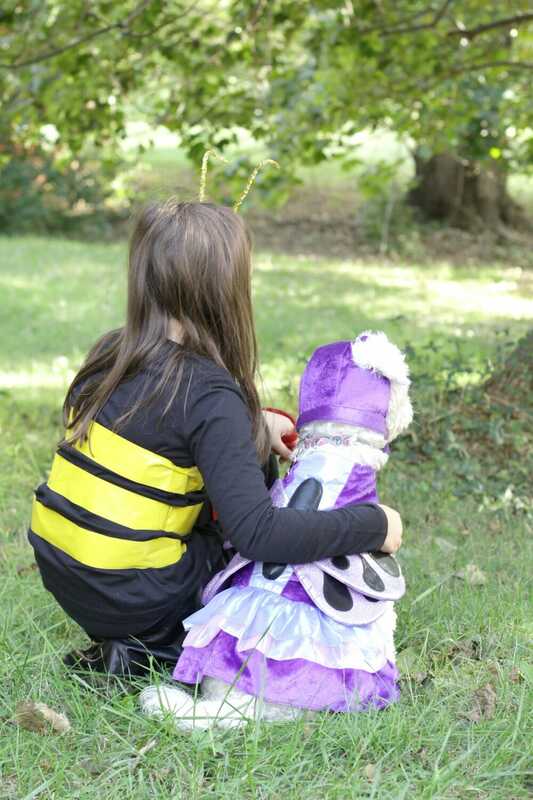 Seems like forever ago that I made costumes for my kids (all 4 of them). When they got older, when we still lived in San Diego area, the 2 boys got themselves dressed up as”Kiss” band players. don’t remember who did their make up but few other of their friends dressed the same, can still remember that like yesterday. The boys are only 16 months apart. Oldest and youngest are girls. I had 3 kids in 4 yrs. Hubs married me with 3 small kids then we had one. Your dog is so cute with her costume on. It’s so sweet and good, for both of them to have each other. 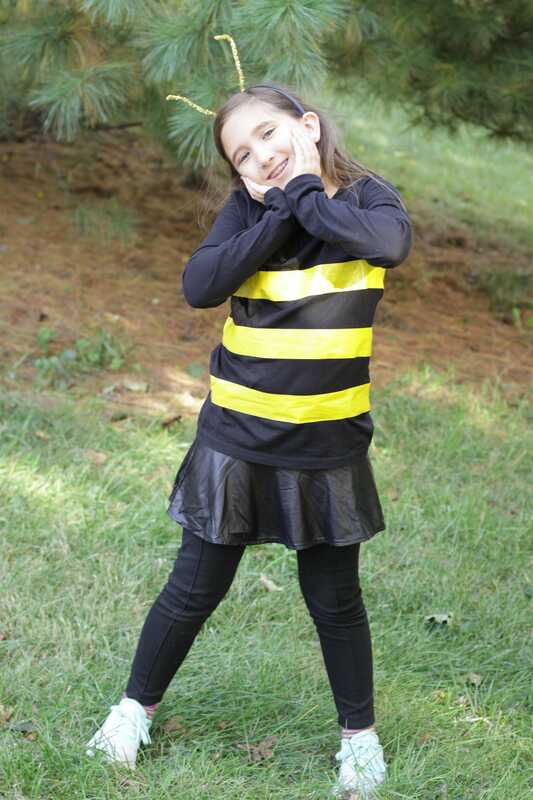 How old is Emma?Great job on her costume, how great it was an easy inexpensive costume. OMG! She is adorable!!! I need to figure out what I’m going to do for the kids. Every year I struggle with either making or buying the costume. Is it bad I purposely buy costumes a size or two larger for repeats..lol! haha! thank you so much!!! and no, that is what i call SMART. oh thank you so much! it was easy and cheap! gotta love that! thank you so much, linda! super simple is the way to go! So smart and she’s adorable.